A competitive advantage is the key factor that Warren Buffet considers before he’ll invest in any business. But with the ever-evolving business world making anything sustainable seem nearly impossible, many believe Michael Porter’s original competitive advantage theory is now null-and-void. Jaynie Smith has proven otherwise, and has spent over 30 years sharing her established beliefs, with audiences and clients, on how businesses can grow by establishing relevant competitive advantages. 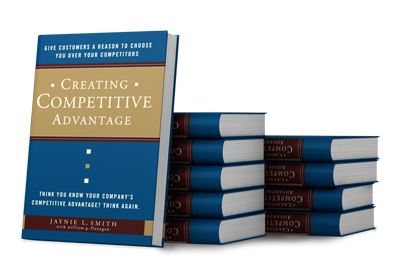 Jaynie L. Smith is an internationally-recognized keynote speaker specializing in the topic of competitive advantage. Content-rich presentations illustrate her proprietary process of uncovering and touting a company’s relevant competitive advantages. Keynotes are focused on showing attendees how to gain market share by revolutionizing the way they articulate and communicate their business messages to sell value over price. Warren Buffet, the most successful investor of the 20th century, will only invest in companies that can claim to, and support, a competitive advantage… So why is it when Jaynie Smith asked over 4,000 CEO’s to name their #1 Competitive Advantage, less than 10% were able to identify a compelling differentiator? The companies who will survive, and thrive, during these challenging economic times will be the ones who know their competitive advantages, and are able to communicate them effectively in their competitive positioning strategy. Jaynie has spent years developing, testing and proving her theory on competitive advantages. She’s developed such a passion for helping companies effectively articulate their value, that she has committed her entire speaking career to the topic. Jaynie is personable, humorous, and uses first-hand case studies in her keynotes to show leaders and industry professionals how to uncover and tout their competitive advantages. Her presentation is content-rich and focused on giving attendees a new way of understanding their business, and new tools to compete more effectively. No other speaker gives your audience as much as Jaynie L. Smith, with a message as important and timely as a relevant competitive advantage. Author of the best-selling business book Creating Competitive Advantage, published by Doubleday Currency (2006) – now in its 13th printing – and Relevant Selling, published by Executive Suite Press (2012) and in its 3rd printing. Hosted Mind Your Biz Today on 880AM The Biz – Online radio show offering business advice for South Florida’s only business radio station. Think You Know Your #1 Competitive Advantage? THINK AGAIN! Based on her best-selling business book, Creating Competitive Advantage, Jaynie’s presentation enthusiastically conveys what a competitive advantage is (and more importantly is not), what prevents businesses from identifying their own, along with the profits that are forfeited when they fail to do so. She provides the framework for uncovering and touting your own competitive advantages to measurably increase your companies’ customer retention and sales close rates. The pressure to lower prices has never been greater than in our current economic state. 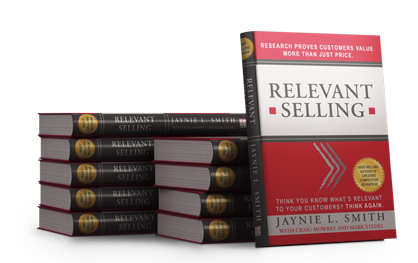 This presentation, based on Creating Competitive Advantages’ newly released companion book, Relevant Selling, will prove that you don’t have to! Customers will pay more for value… the problem is, most marketing and sales efforts fail to convey what customers value. As a result, customers revert to price as the tie breaker in the buying decision. This presentation enlightens even the most seasoned business professional. Based on both of Jaynie’s books, this keynote introduces the topic of dangerous disparity. Most companies consider themselves ‘customer focused.’ This talk will prove to you how the majority of businesses are missing the mark. In her study of over 100 companies, regardless of company size or product offering, 90% of what these businesses were offering greatly differed from what their customers valued. Jaynie passionately advises her audience on the steps your company needs to take that will build confidence, remove risk, and minimize price as an issue in the buying decision. Is Jaynie available for your event? Click calendar to check availability?